A warning about climate change wrapped in a tender package of stories about penguin chicks and fur seals. Zoologist James McClintock has spent his career in the Antarctic, lovingly examining and meticulously documenting the wildlife, from the leopard seals and emperor penguins to the tiny sea butterflies and plankton, while recording changes in ocean conditions. 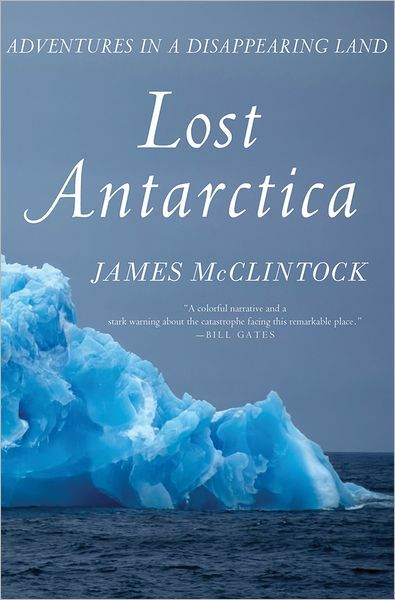 Lost Antarctica collects a selection of his experiences: deep-sea diving, storms at sea, sightings of creatures large and small and other discoveries of tiny, crucial instances of evolutionary genius. Although he takes his time getting there, McClintock’s most important point is cautionary: Antarctica, he says, is an early warning for the rest of our world. McClintock has observed climate change firsthand and can lend his firsthand knowledge to other studies that document and explain the crisis. He also addresses “the other CO2 problem”–the increasing levels of carbon dioxide in our oceans that lower the water’s pH levels. The combination of ocean acidification, rising temperatures and melting ice threatens many species and their delicate relationships with one another–and the consequences extend even further, as some organisms that live only in Antarctica have been shown to yield chemicals that can help fight cancer and influenza. While Lost Antarctica is an alert about climate change and ocean acidification, it ends on a surprisingly hopeful note. McClintock’s message is reasoned and well documented–and his descriptions of a wondrous world of coral, starfish, sea sponges, fish, crabs, penguins and birds of prey make this important scientific message accessible to the general reader. This review originally ran as a *starred review* in the Sept. 21, 2012 issue of Shelf Awareness for Readers. To subscribe, click here, and you’ll receive two issues per week of book reviews and other bookish fun!